When it comes to color, fashionistas can either use it as an excuse to push the envelope with bold, daring hues or take a more subtle approach with delicate pastels. During New York Fall Fashion Week, both vibrant colors and muted pastels made a major impact on the runway. These styles are expected to be huge this season, so women who prefer either end of the color spectrum can (and should) embrace both trends. This trend was 1993. 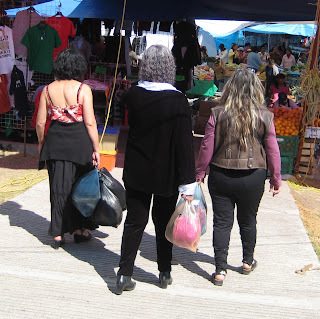 The fashions arrived in San Miguel yesterday and were quickly snapped up. 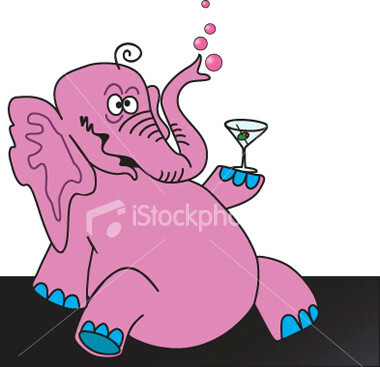 “Seeing pink elephants” is a euphemism for drunken hallucination, caused by alcoholic hallucinosis or delirium tremens. The first recorded use of the term is by Jack London in 1913, who describes one sort of alcoholic in the autobiographical John Barleycorn as “the man whom we all know, stupid, unimaginative, whose brain is bitten numbly by numb maggots; who walks generously with wide-spread, tentative legs, falls frequently in the gutter, and who sees, in the extremity of his ecstasy, blue mice and pink elephants. He is the type that gives rise to the jokes in the funny papers.” London may have derived his metaphor from the 1890s saying “being followed by pink giraffes”. Again, the inspiration for new Gangs can come from many many different places – some literary, some from the aftermath of one too many Happy Hour. And sometimes from that place deep within us that only magic can release. The Black Widow is powerful image that stirs fear in the hearts of all who see her because deep down we believe that she can kill us. This popular joke gets to the heart of our fears. Why do Black widow spiders kill their mates after mating? To stop the snoring before it starts. A google search revealed that adult male Black Widows wander in search of females but do not feed or bite. Females may occasionally kill and eat a male after mating but this is more the exception than the rule. Can female black widows kill cats? More evidence showed that small children and the elderly are often more symptomatic and can have a more severe reaction to the venom of the Black Widow. So it is not an accident that The Black Widow Gang of San Miguel chose a very appropiate image for their gang. They are always waiting for an elderly male to happen by. They are hard to see all in black and failing eyesight makes it hard to see the shadows. They are shy by nature and bite only when trapped, sat on, or accidentally touched but remember there are no accidental touchings by women in San Miguel. A person who gets bitten by a Black Widow might not know it right away, since the bite can sometimes feel like a little pinprick or a simple bump of the arm. After 30 to 40 minutes of continual talking by the Black Widow, though, the area of the bite will swell and hurt a lot, and sometimes a person can get achy all over. Other symptoms can include weakness, nausea, vomiting, sweating, headache and an invitation to dinner or a drink. If you ever think that you’ve been bitten by a Black Widow, tell an adult immediately. Black Widow bites rarely kill people, but it’s important to get medical attention as soon as you can because they can make you very sick. Avoid Black Widows through exclusion. Do whatever you can to keep Black Widows from getting into your home in the first place. Apply weather stripping to all windows and doors. If you don’t have them already, install door sweeps. Make the outside of your house and your yard inhospitable to Black Widows. The first thing you will want to do is to clear away any and all vegetation that might be up close and personal with your house, especially ivy. That stuff is a haven for them. They love to hide and wait for you to come out of your house for a chance meeting. Cut back shrubs, plants, and decorative grasses. Get rid of rock piles, and move any wood piles as far away from your house as possible. Men should never be on their own, they don’t know how to keep a house. Rearrange furniture on a regular basis so you can find any widows that might have set up shop. Go on a search and destroy mission. At night (they’re nocturnal), go around with a flashlight and a stick and let the fun begin. Keep in mind that black widows are never far from a hiding place. If you screw up, they will go directly into marriage mode and you might not get another chance. Look in closets and cupboards, behind furniture, and search anywhere else you think a black widow could be hiding. If you’ve got the guts, spend some time in the attic, the basement, and the garage. These are great places for black widows. Remember to always be careful, wear gloves and boots, and tuck your jeans into your socks. It looks cool. I promise and Black Widows will think you are a dork. Two men poisoned by anti-freeze, laid to rest in the same cemetery side by side. Was the grieving wife, Stacey Castor, really a Black Widow, murdering both of her husbands just a few years apart? And was this woman so twisted that she poisoned her own daughter, Ashley, to stage it as a suicide and frame her for the heinous crimes? Or was the daughter responsible for the men’s deaths? For nearly two years, ABC News Correspondent David Muir has been following the twists and turns of a bizarre mystery that captivated an entire community, played out in an upstate New York courtroom. Whom will the jury believe – mother or daughter? Chairman Mao had his little Red Book. The wolf had little Red Riding Hood. I have been so careful to use American spellings in this blog as not to reveal my background but today I am going to be Canadian. We say neighbour, cheque, night, eh and the last letter of the alphabet is pronounced zed not zee. The reason for this, is that today, there has to be a U in color just like there is no I in Team. Yes, today is a celebration of the you in Colour. SAN MIGUELENSES have such a sense of Colour. Why be content with one colour when you have a whole rainbow of colours. Yes the Colour Gang not only loves Colour but each member has their own song. And for some there is even stage direction. This is no ordinary Gang. This Gang has style and lyrics. 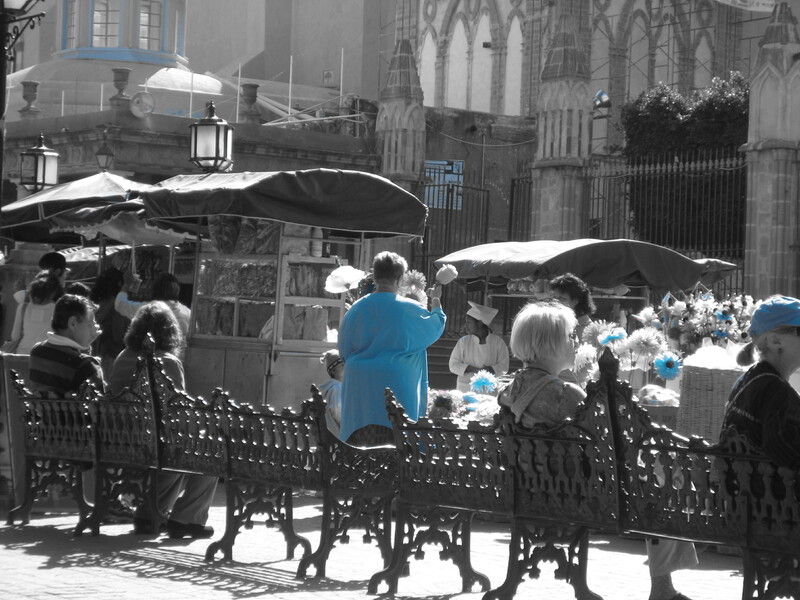 The Colors of San Miguel are the inspiration for this group. With all the competition between gang members to catch a man, they have taken the competition one step further. 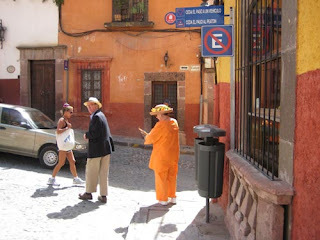 They choose garb in the colors of the buildings in San Miguel and blend into the building. If you very look closely at this picture you can see a gang member in a burnt umber/orange color lying in wait for a man. If you can’t see her look for the newspaper she is reading. The man in the picture has no idea of what is about to befall him and the woman walking by will offer no assistance. To further demonstrate the point see what happens when someone doesn’t get the Chameleon Concept. This picture was taken from the Chameleon Gang Manual about What Not To Do. The purple member doesn’t understand color blending and will come home to her pied a terre without a Love Slave. Street Gangs in North America identify themselves by picking their Color(s). 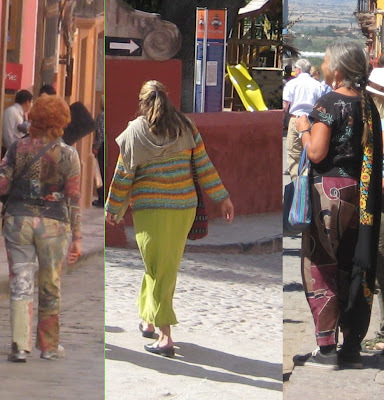 In San Miguel one gang has taken this to a new level by picking only one Color. Members are free to pick any single Color that speaks to their inner voice. Once they have that Color then they dress from head to toe in that one Color. Some of the more successful members of this gang go on to join the Chameleon Gang. Here they can put their color co-ordination to use and enslave a man. Not content to just color themselves up, many paint their VW’s to match their Color. If you see a pink VW then you can be assured that a vision clad in pink will emerge. Why the VW? No one knows. The Mary Kay Car is missing a member. Well Mary Kay is missing more than a just a member. What can you say about this gang that the picture doesn’t tell you? They might be a Mexican gang and not American as they were speaking Spanish but don’t be fooled if the gang speaks Spanish. Many gang members take Spanish lessons so they can order pastels and tapetes. This gang believes you can never wear enough colors at the same time. They are one of the most competitive gangs in San Miguel trying to out do each other in clashing colors. But be very careful if you like to wear only white and/or black or the dreaded beige. They will surround you and yell very nasty things at you. 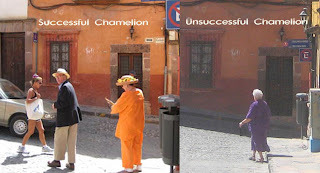 Be prepared to be called a ‘onecolored’ tourist and be splashed with phosphorescent colors.